A true neutral, extremely elegant over black, purple, deep reds, teal, it's endless. 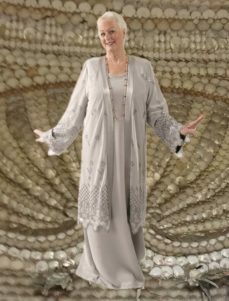 Peggy Lutz Tunic-Length Kimono Jacket in mercury/silver with a satiny, softly crinkled surface is your best dressy basic. The underside of the fabric is black; the fabric is opaque, pre-wrinkled and very lightweight, which make it a terrific addition to your travel wardrobe. Take it on a cruise for cocktail hour over a black dress or separates of almost any color. 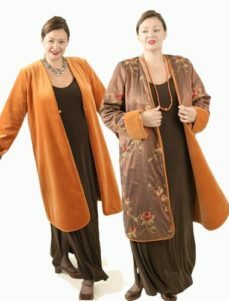 Wear with a red cocktail dress, black separates, your favorite LBD..
100% polyester, machine wash delicate COLD, hang dry. A few blasts of steam with your iron held a little away from the fabric will take out any creases instantly. 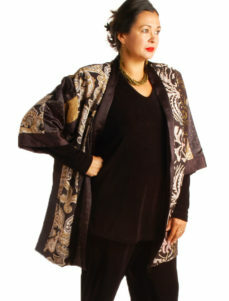 Be the first to review “Special Occasion Kimono Jacket Mercury Crinkle Sizes 18 – 32” Click here to cancel reply.